Even though in general the cirrocumulus clouds indicate a fair weather, sometimes they develop an accessory that is bound to bring rain or snow. The accessory that is commonly associated with precipitation is formed at the base of the cloud and it is commonly known as a cirrocumulus virga cloud formation. Meteorologists worldwide describe this structure as a visible precipitation streak. However, because their composition does not include very large droplets of precipitation, the rain or snow will usually evaporate before reaching the ground. On the other hand, they can constitute the basis of a storm whenever the precipitation reaches other storm clouds. How are the cirrocumulus virga clouds formed? The entire virga phenomenon is thought to be formed due to compression heat. More exactly, as the ice crystals from the cirrocumulus get closer to the ground they tend to heat up because of the air pressure and gravity. Even though the rain, drizzle or snow will evaporate high in the atmosphere at slightly lower altitudes than the actual cirrocumulus, it is important to note that they are quite tricky for aviators, as they are usually responsible for harmful straight line and divergent winds. This occurrence, also known as a microburst, is said to be able to produce wind speeds of 270 kilometers per hour. How do cirrocumulus virga clouds look like? The virga formation can be described as a flimsy and delicate line that seems to be attached to a cloud. Depending on how much precipitation it has, sometimes the thin line can take the form of a curtain or drape that falls, but never reaches the ground. The rod, streak or stripe shape of the high virga clouds are especially beautiful during sunrises and sunsets, as they tend to take on a reddish to orange coloration. However, even though it can develop during mid day as well, its specific form can easily be observed and identified. 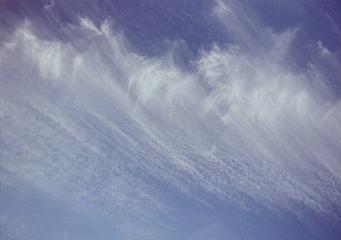 How common are cirrocumulus virga clouds? Since their development depends on a higher ground and lower atmosphere temperature, the virga clouds are more common for desert areas and temperate climates. After all, according to meteorologists, virga stands for a precipitation structure that does not reach the ground. Considering that deserts have high temperatures and quite low humidity, it is perfectly understandable why they are mostly observed in those locations. However, it is worth noting that the virga structures can also appear in the continental temperate climate, usually with the dry thunderstorm clouds. Across the United States and in Canada for instance, cloud formations that produce thunder and lightning as well as an insignificant amount of precipitation are very common. This phenomenon is actually typical for the West part of the United States and Canada.